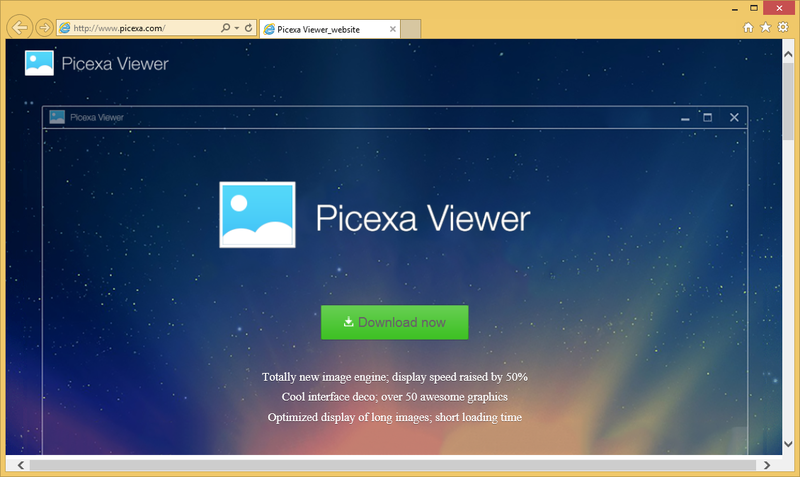 Picexa is an application that promises to open images in a variety of formats very quickly. Therefore, many users decide to install it on their systems. Unfortunately, many users find out that Picexa is not that beneficial as it claims to be in a very short period of time. The main reason why it is so is the fact that Picexa starts showing commercials shortly after it enters systems. Numerous pop-ups, banners, shopping suggestions, coupons, and other kinds of advertisements are surely very irritating. They might even put your system at risk. Therefore, it would be wise to remove Picexa even though it seems to be a beneficial image viewer. Luckily, Picexa can be erased like other adware programs, so it will not be difficult to do that; however, we suggest reading through the article to find out more about the removal process. It might really allow users to open images; however, we cannot ignore the fact that it shows hundreds of commercial advertisements on a user’s screen. As has been mentioned, these ads might appear in a variety of forms. They might not only interfere with your browsing activities, but might also take you to untrustworthy web pages. It means that Picexa can contribute to the entrance of malicious software. Ads are not dangerous if you do not click on them. Unfortunately, it might be really difficult to ignore them and not to click on them accidentally. Specialists say that Picexa might also track you to be able to provide you with the ads based on your interests on the web. It should not touch any of your personal details; however, we still suggest being cautious because adware not always do what it says it will do. If you want to be sure that you are safe, the best would be to delete Picexa fully. Picexa travels like other previously published adware programs – it comes together with other applications. These applications are usually free programs that can be easily downloaded from third-party web pages, e.g. softonic.com. Picexa adware might enter the system with the help of other untrustworthy programs that are installed on your system too. If you want to protect your system, you should always pay close attention to the installation of free software. It is also advisable to install a security tool on the system and enable it. How to uninstall Picexa from my PC? We are sure that there are hundreds of other reliable programs for viewing images. Therefore, you should go for the Picexa removal as soon as you can. Even though the Picexa removal process will not be very easy, we are going to help you with that – you will find instructions below this article. If these instructions do not help you to remove Picexa for any reason, scan your system with an automatic scanner. We are sure that it will delete Picexa for you. It will also protect your system from future malware.